_ Five Filipino indigent children of different ages in different parts of the Philippines are being supported through various outreach programs. We have pledged to support them financially until they finish their high school education. Financial support goes to their food, clothing and medical care. In the Toledo area, we also support organizations geared to help the poor and prevent family abuse. Among which are The Bethany House, The Family and Child Abuse Prevention Center, The Cherry Street Mission, The Salvation Army, The Little Sisters of the Poor, International Services of Hope, and Kitchen of the Poor. Filipino Association of Toledo volunteers cook traditional food two times a year, during Thanksgiving and Christmas season, and serve it to the poor and the homeless. nature. Modern technology cannot prevent the onslaught of typhoons, earthquakes and flooding. The devastation destroys all material things, but not the will power of men to survive and start a new life. We will be there to give them support and uplift their hearts and spirit. The victims of Mount Pinatubo eruption, and victims of several typhoons and earthquake in the Philippines had been recipients of our support. medical team to help in the Typhoon Katrina disaster. A team from SCORE also was sent to Indonesia Tsunami. When Haiti was devastated from the earthquake, a medical team including emergency care, general surgical and orthopedic specialties were one of the first organized team that provided the needed medical care. Since the earthquake, our specialty team has visited Haiti every year, providing medical care. A Water Filtration program has been instituted, distributing to families a Water Filtration system that would last for 2 years. This has enormously helped the prevention of water borne diseases. _Two college scholarship grants and one private high school scholarship grant is awarded every year to deserving students enrolled in an accredited institution. Criteria for selection is based on their scholastic standings, involvement in the community and with the Filipino Association. Their parents have to be a member, of good standing, of the Filipino Association of Toledo. A matching scholarship program is also available to qualified students. SCORE also supports several students in the Philippines through the Columbian Missionaries in Mindanao. A seminarian in Legaspi City is the recipient of a four-year financial aid from SCORE. Josefina/Aurora Zamboanga in 1997 and 1999. In 2000 another mission was held in Camotes Island, near Cebu, and the following year, April 23-30, 2001, we had a mission at Manaoag, Pangasinan. The latest mission was held on April 1-7, 2002 in San Ricardo, Leyte. We were able to provide medical care to thousands of indigent patients, perform hundreds of major surgeries and countless dental and ophthalmological surgeries, and provide medicines needed for their continuing care. Several containerized shipments of medical-surgical supplies had been sent overseas. Containerized shipment of hospital beds, operating room instruments and equipments were donated to a charity government hospital in Butuan City. Physicians and medical personnel from the United States team up with The University of Sto. 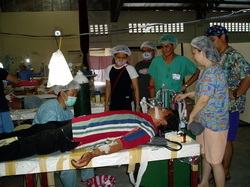 Tomas Medical mission team, in providing the appropriate services. SCORE provides the needed funds to ship medical supplies and equipment to the mission area. 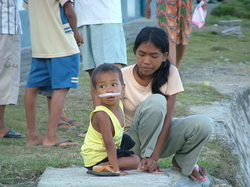 Volunteer physicians and personnel provide their own fare from Toledo to the Philippines, and other needed personal expenses. If interested to join the medical mission team or donate any medical goods or equipment, contact Richard Paat, M.D. _We support several religious missions in the Philippines in their efforts of propagating the faith and their educational programs. Among the religious organizations that have benefited from our programs are The Colombian Fathers in Zamboanga, through Father Donald Kill, The Assumption Sisters, Xavier of Kitanlad Bukidnon. The Saint Clare Monastery in Josefina, Zamboanga were the recipients of a grant from SCORE for the drilling of a water well as a source of their water supply.